Courtesy photo Front row, left to right: Andrew Eckman and Ben Dufoe. Second row: Daniel Martin, Martin Berergon, Jackson Goldstein, Adam Connelly and Travis Lafontaine. Third Row: Ben Petrella, Elliot Troddyn, Alex Razzaboni, Bryce Sturges and Gavin Knudsen. Back row: Coach Kevin Martin, Manager Bob Knudsen, Coach Bob Goldstein. Not pictured: Evan Costa. The Hollis Brookline Cal Ripken U11 All-Stars opened state tournament play in Nashua on Saturday with a 5-4 win over Londonderry. In the top of the first, HB set the tone with two great defensive plays. Jackson Goldstein doubled off a runner at home attempting to score on a bunt and Andrew Eckman ranged deep into the outfield from shortstop to snag a fly ball and keep the game scoreless. Eckman then drove in Goldstein and Gavin Knudsen with a two-out single to put HB up 2-0. Londonderry tied it up by scoring unearned runs in the third and fourth inning. In the fifth, Ben Petrella started the game-winning rally with a leadoff line drive single to left field. Starting pitcher Alex Razzaboni, who pitched three strong innings allowing only one unearned run and striking out three, put HB up 5-2 with a scorching two-run single off the fence. Knudsen picked up the save, recording the final two outs after Londonderry scored two in the sixth off winning pitcher Jackson Goldstein. 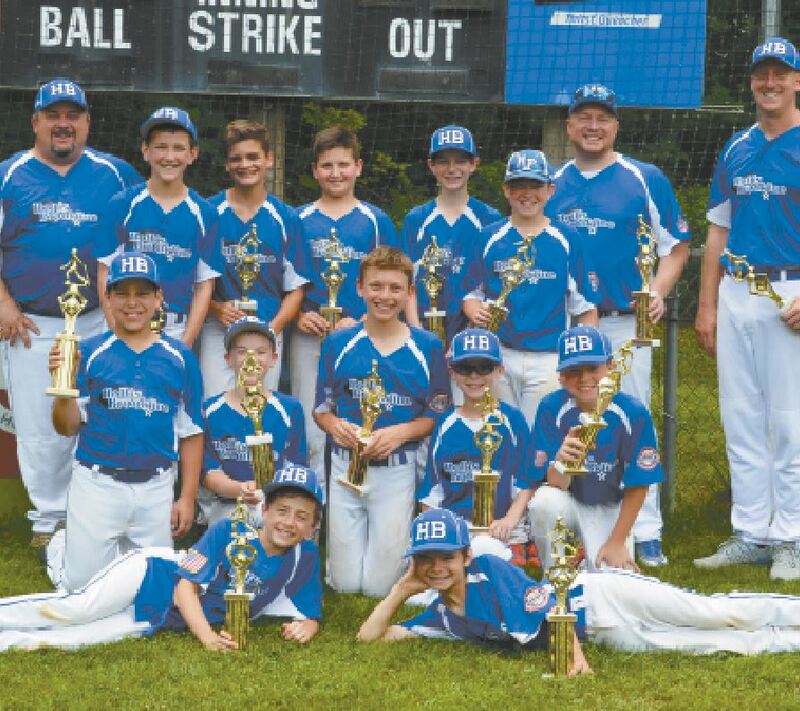 HB jumped out to an early lead and held on to beat Dover 8-5 on Sunday, clinching their first-ever appearance in the Cal Ripken New England Regional tournament. Bryce Sturges pitched three shutout innings, while Daniel Martin and Jackson Goldstein each drove in two runs. Gavin Knudsen, Andrew Eckman and Martin Bergeron each added an RBI to pace the offense. Travis LaFontaine lead the defense with several key plays at third, and then closed out the game on the mound for the save. The win guaranteed HB a top-three finish and set up a rematch with Nashua in the winner’s bracket semifinal. HB fell to Nashua 9-8 in a seven-inning heartstopper on Wednesday night under the lights in front of Holman Stadium in Nashua. Jackson Goldstein of HB and Derek Finlay of Nashua were locked in an epic pitcher’s duel, with Nashua carrying a 2-1 lead into the sixth inning. With one out in the top of the sixth, the HB bats came to life. Goldstein and Alex Razzaboni singled and then Daniel Martin hit a clutch three-run homer over the high fence to put HB up 4-2. Nashua fought back in the sixth, with Finlay tying the game up by beating out an infield single to send the game into extra innings. In the seventh, HB jumped on top again. Travis Lafontaine, Adam Connelly and Bryce Sturges all walked to load the bases, then Goldstein and Alex Razzaboni hit back to back doubles putting HB back on top 8-4. However, Nashua showed why they are a top-ranked team and refused to quit. Jordan Joyal hit an RBI double in the seventh and after a couple of HB errors, Nashua had the bases loaded down 8-7 with one out. Gavin Knudsen struck out the next batter and was ahead of Cam Brown 1-2. After a close take for ball two, Brown laced the next pitch for a two-run walkoff single up the middle to propel Nashua to victory. HB finished third in the state tournament after losing to Dover 9-6. After falling behind 2-0, Andrew Eckman started a two-out rally with single and scored on an Elliott Troddyn single, who was followed by an RBI double to the center-field fence by Adam Connelly putting HB up 3-2. Dover came right back with two runs in the third and one in the fourth to take a 6-3 lead. Once again, HB battled back with three runs in the fourth, as Eckman and Ben Petrella singled and Ben Dufoe doubled past the right fielder. Gavin Knudsen then tied the game at 6 with a line drive single to left field. Dover came right back with two runs in the fourth and one in the fifth and the bullpen shut down the HB attack to seal the victory. HB will begin Regional play in Dover, opening against Rhode Island in Game 1 on Saturday, July 29.